The history and discography of Central and South American Rock groups remained unknown until the end of the 80 s. Record collectors from all over the world discovered that in the 60 s and 70 s some excellent recordings were made in Mexico, Argentina, Peru, etc... Today there is great demand and worldwide interest on these foreign releases, sometimes made with crude recording equipment, amateur techniques, and with pressings done, most of the time, on recycled vinyl. This work attempts to inform on the different styles, the history, and development of Rock in Peru. We are constantly receiving information from Peruvian musicians and collectors to augment and enrich this anthology...so, this a public effort, and we will be forever in debt with all our contributors. 1955 to 1964: The Peruvian Rock music scene was basically influenced by Rockabilly and later on by the tidal waves created by Elvis Presley and The Beatles. Peruvians groups played in the musical styles of Elvis, Bill Hayle, Buddy Holly, etc.... Some of the most popular groups were : Los Alfiles with Cocho Arbe, Los Stars with the Barreda Brothers and Jaime Alvarez Calderon, Conjunto Astoria with Walter Ugarte and Roberto Noriega (1960), Los Atomos, Los Incas Modernos with Manuel Garcia ( this group released the first rock instrumental long-play under El Sol in 1963), also the same year, Los Zodiac s, with Jaime Castañola, recorded several 45 RPMs for IEMPSA. Recordings of Peruvian groups from this period are very few and difficult to find. 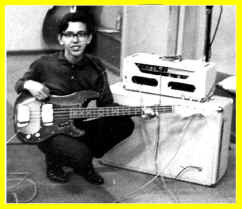 1964 to 1966: the influence of Surf music, Go Go, the Beatles and some of the first Mersey Sound groups inspired the new generation of Peruvian Rock musicians. One of the pioneering groups was Los Saicos. They recorded 6 singles with hits like "Demolicion" for the DiscPeru label . Los Saicos were formed in 1964, after Roberto Carpio, a guitar player, came back from England where he spent time listening to the best Rock groups of the London underground scene. Roberto convinced his brother ,and his friend Edwin Flores, to form Los Saicos and play the new music. They were one of the first recorded groups ( together with Los Shain' s) in South America to play their original compositions in their unique style : a mixture of Surf, Garage and early Psychedelic Rock. Other groups with similar style did not started until 1966, like Los York s ( formed by two ex-members of Los Saicos) and Los Jaguars. Some other groups were influenced by the Beatles and pop music, like Los Doltons, a group that got started in 1964 with Gerardo Manuel and was very popular, Los Silvertons and the instrumental group The Belking s.
In 1964, Los Shain s were formed with Pedro Pajuelo playing drums, Nestor Muente-Saco Vertiz, as the vocalist, and their leaders, Juan Luis Pereira, first guitar and Enrique Ego Aguirre, rythm guitar. The last two musicians were the best guitar players in the country. 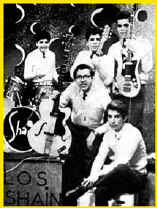 This first edition of Los Shain s recorded several 7" singles before Pereira, the lead guitarist, left the group to join Los Draxs. Their first 45 rpm was released in November of 1964 with the songs "Tomahawk," an instrumental, and "Girls Everywhere." Ego Aguirre became the main leader and together with the group s new member, Gerardo Rojas, a singer and composer that contributed with many new songs, recorded their first lp "El Ritmo de Los Shain s", that was an immediate success. Their major influences at the time were: Trashmen, The Ventures, Sam the Sham, etc. In 1964, Jose and Freddy Rizo-Patron, Ramon Orbegoso, Diego Garcia Sayan and Felipe Larrabure founded Los Hang Ten's, a high school rock band. After playing for friends and for the love of music, finally, in 1966, they were offered an opportunity to record a 45 RPM for Odeon, a Peruvian label. Many years later, with new members and with the desire to became professional musicians, Los Hang Ten's became Traffic Sound in 1967. In 1965 an obscure group was formed in the district of Maranga, The New Juggler Sound. This group was going to influence many other Peruvian musicians and rock groups in the future. Their first recording, with two original composition by Manuel and Saul Cornejo ("Baby, Baby" and "I Must Go"), was a 45 rpm for RCA. 1966 to 1972: these five years saw the greatest proliferation of psychedelic groups. They also account for the majority of recordings of garage and psychedelic music in Peru. Groups like Los York s, with a mild psych influence in their "York s 67" lp, turned to play almost strictly psychedelic music in their next two lps, "York s 68" and "York s 69". Los Shain s continued with two great lps "Segundo Volumen" and "Docena Tres", both of them with a strong psychedelic influence. Also some of the members changed, this time they were reinforced by the Barreda brothers, Juan Carlos in the electric bass and Carlos Manuel, who is now a professional musician in San Francisco, playing drums; both were outstanding performers. In 1967 Traffic Sound was born, causing a great deal of turmoil with their style. They were one of the first Peruvian rock groups to tour South America giving a series of successful concerts. Traffic Sound recorded 4 lps from 1968 to 1971, "A Bailar Go-Go", "Virgin", "Traffic Sound" and "Lux". They also recorded 5 songs not included on the lps but released on singles. In the beginning their mayor influences were The Doors and Jimmy Hendrix. This is evident on their first lp,"A Bailar Go Go". Starting their second lp, "Virgin", they developed their own style that was a mixture of hard rock, psychedelic and Latin music. Their unique style made them very popular. 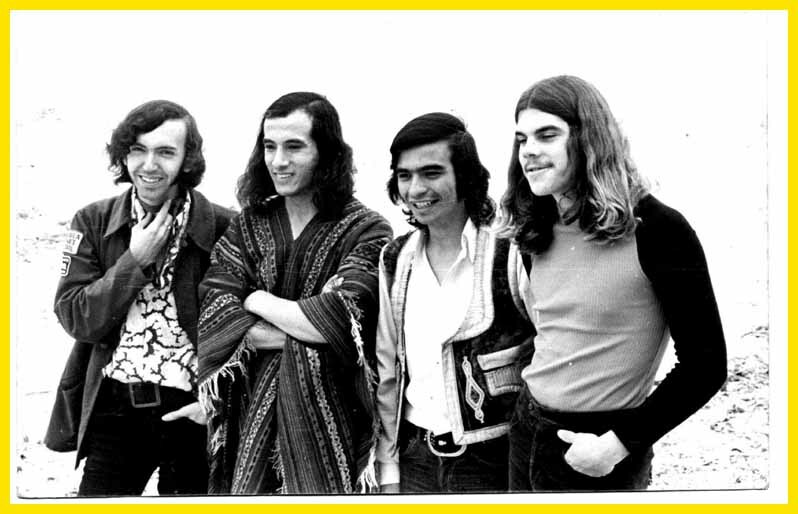 Other groups from this period were The Golden Stars with their hits "Pasto Verde" and "Angel", Los Mads, with the Macedo Brothers and strongly influenced by The Kinks, Los Steivos, with Coco Salazar and Frank Privett playing guitar, and groups and singers of Soft Rock and pop music like Los Pasteles Verdes and Pepe Cipolla. At the end of 1968 Los Shain s were divided by a disagreement on musical styles. Enrique Ego Aguirre retained the name of the group, found new members and recorded "Los Nuevos Shain s" . Other groups of the period were: Los Sideral s and the instrumental group Los Holy s, that featured the drum solos of Walo Carillo, soon to be a member of Telegraph Avenue and Tarkus. In the meantime, The New Juggler Sound, changed its name to Laghonia and released two lps for the MAG label. Their first lp, "Glue", very much sought after by collectors, is a fusion of heavy garage sound with strong psychedelic influence. In 1969 Laghonia released a second lp, "Etcetera", as beautiful and sought after as the first one. Their last release, also on the MAG label, was a single with two songs not included on the lps: "World Full Of Nuts" and "We All." In 1970 Gerardo Rojas changed his artistic name to Gerardo Manuel.Together with Jorge Pomar and Richie Zellon formed El Humo, recording one of the best Peruvian psych lps, "Apocallypsis" . Other groups of the time were, El Alamo and Cacique, with a Latin rock style, El Opio and El Ayllu, with a strong influence of native Peruvian folkloric music. In 1971 Gerardo Manuel and El Humo recorded "Machu Picchu 2000" ,one more time with the participation of the great Peruvian guitarist and composer Richie Zellon, who at the time was a member of the group El Ayllu. Richie contributed with the record s title song,"Machu Picchu Blues". Most other groups started evolving into playing a mixture of Beat and dreamy Psychedelic music, like Telegraph Avenue; also, there were a few singers with heavy psych style, one of them was Jean Paul "El Troglodita" and his hit lp "Vudu". Also in 1971 another group, in the Laghonia style but more musically aggressive, was born: Tarkus. They recorded one lp with 8 original compositions. This is the most collectible psych lp in Peru, and the most advanced, music wise, since their style was years ahead of their time. 1972-1980: Enrique Ego Aguirre changed the name of his group from Los Shain s to Pax and recorded one lp and several singles. His style was influenced by Black Sabbath and Deep Purple. One of the singles contains "Dark Rose", the first full speed ahead funk /rock song ever recorded in Peru. 1972 was the year of El Polen, one of the first Andean Acid Rock groups ever. Their first lp was the soundtrack of an European movie, "El Cholo", based on the life of the Peruvian soccer player Hugo Sotil. Their music was a mixture of psych rock and andean music played on native instruments,quenas and antaras, with traditional rock instrumentation, creating a unique style where violins sounded like fuzz guitars. El Polen s "Cholo" and Los Jaivas "El Volantin", were the first acid folk lps from South America. In 1971 Laghonia changed its name to We All Together to form one of the best soft rock groups ever. WAT recorded their first lp in 1972 with songs like "Hey Revolution", that show their admiration for the music of the post-Beatles era. They recorded another lp in 1974 and a mini-lp, with a picture cover, in 1975. 1973, El Polen recorded their second lp, "Fuera de la Ciudad" ,continuing with their pioneering style. Another group, El Trebol, formed by the Garay brothers and initially known as Los Spectros, recorded their first lp, "Buscandote", in the style of El Polen but with a stronger rock instrumentation and psychedelic influence. In 1975, We All Together was dissolved and their members formed two bands : You (Duweto) and Amigos. This last band, Amigos (Friends) recorded an lp that was not released and contained original composition similar to the ones WAT used to make. 1979, was the end of the psychedelic era in Peru, the music changed to Progressive Rock . One of the best Progressive groups was Fragil, and their first lp, "Avenida Larco" (Pantel-1981), was an immediate hit. This first lp was reissued on compact disc together with their second recording "Serranio" that was never formaly issued on long-play format with the exception of a few promo copies given to radio stations. Shortly after, the first Heavy Metal and Punk Rock groups were formed. Very few recordings were done from 1980 to 1985 due to low sales of recorded music ,a crisis in the Peruvian music industry and the illegal activities of "bootleggers" that would reproduce any hit records on cassette and sell them for a fraction of the price of the legal recording. The bands will take their studio recorded tracks to radio station to promote their music, but most of the time the recordings were not available for the public. If the members of the band could afford to reproduce their music, they would do it in cassette and 45 rpm formats and sell them during their concerts. Rock is still an important musical style in Peru . Many new recordings have been made since 1985 and many new groups have been formed since then. This work continues and it will be upgraded as soon as we get more information. By George Bonilla Copyright ©1995 Lazarus Audio Products.